I’m lucky to have a group of friends that loves travelling and hiking. Every year, we do at least one epic trip to explore America’s beautiful outdoors. Mount Whitney, Zion, Bryce and Havasu Falls have been some of our previous destinations… and this year, it was Banff’s turn. 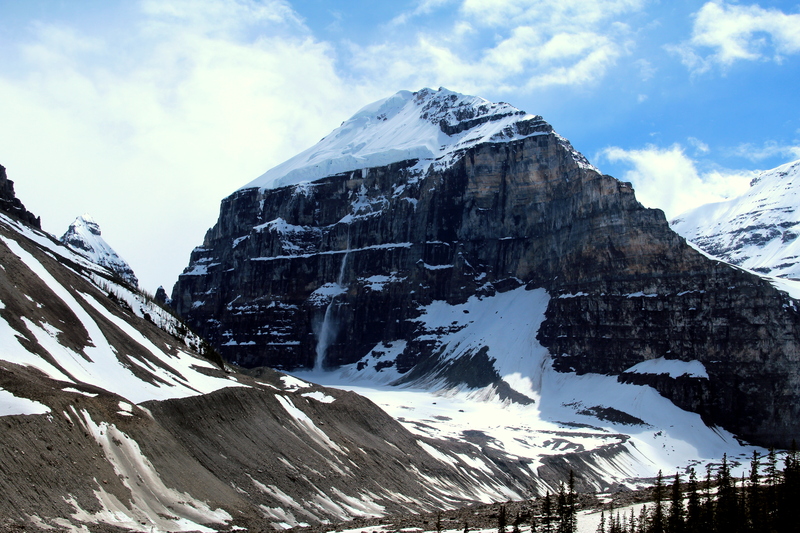 About 2 hours west of Calgary, Alberta, Banff was Canada’s first national park. Its landscape includes forests, alpine mountains, glaciers and the most famous, intense blue lakes. 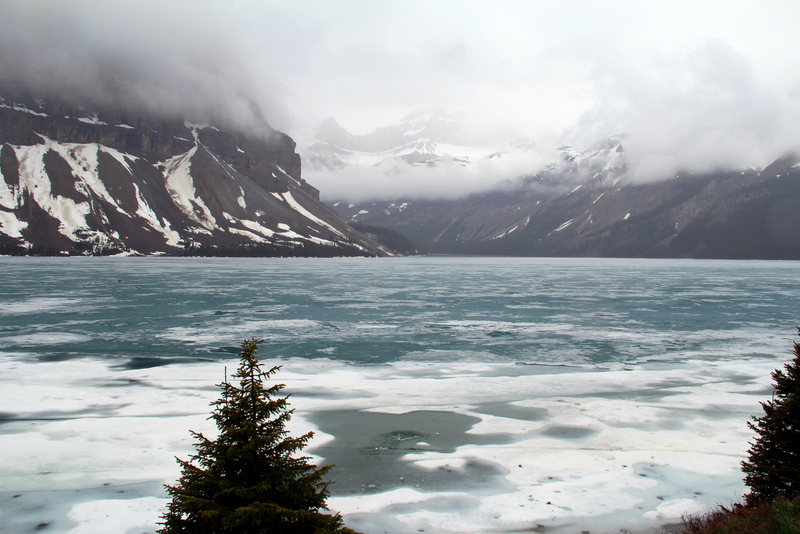 First stop, to whet our appetite, Bow Lake, completely frozen and beautiful. 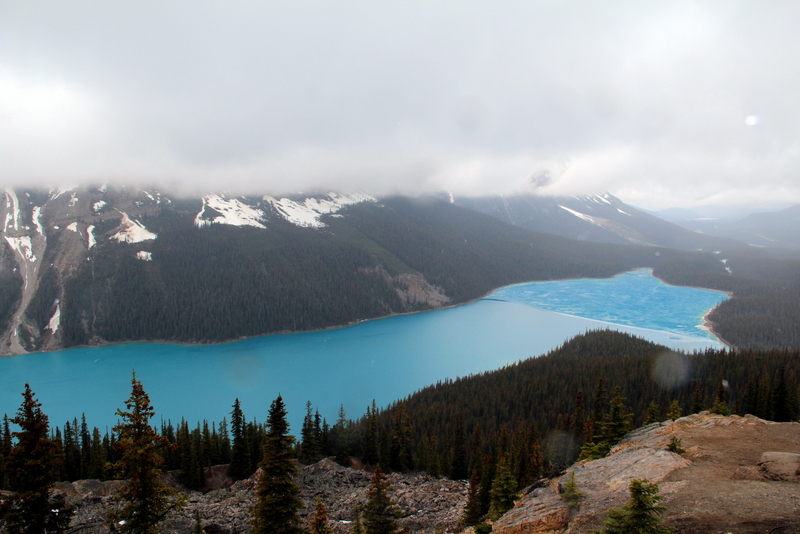 Second, one of the main courses: Peyto Lake. A 15 min walk on an easy, yet frozen, trail takes as to the lookout over the immense tongue of cobalt blue. Next, another short drive and another short walk to Waterfowl Lake, which I bet is a super nice camping spot in the summer. Each lake is similar but unique, with its particular shade of blue, and different peaks and trees around. 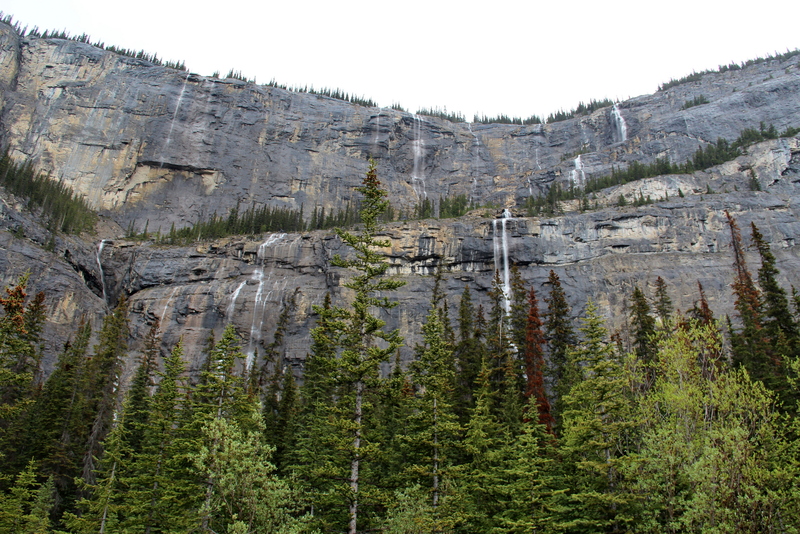 We continue driving north, stopping at the Mount Amery viewpoint, where the Mistaya River looks cyan, and at the Weeping Wall, and… wait, is that a bear? 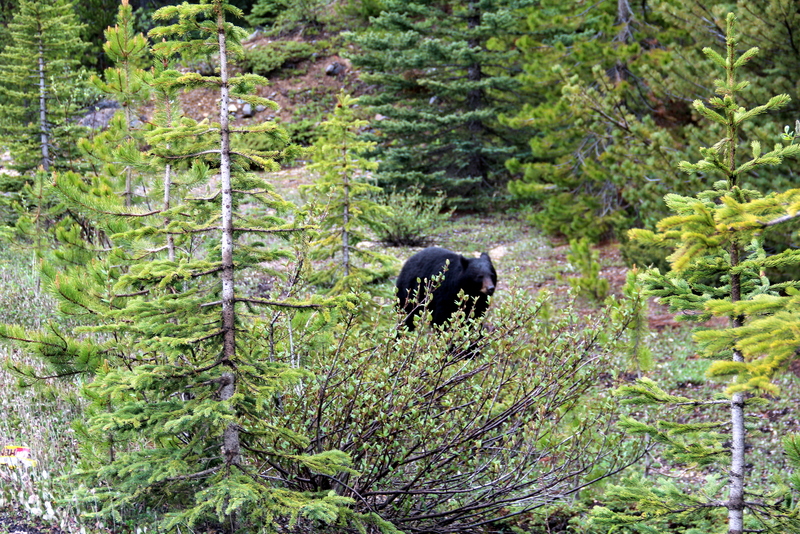 Yes, a small black bear that probably just came out of hibernation and is looking for food. 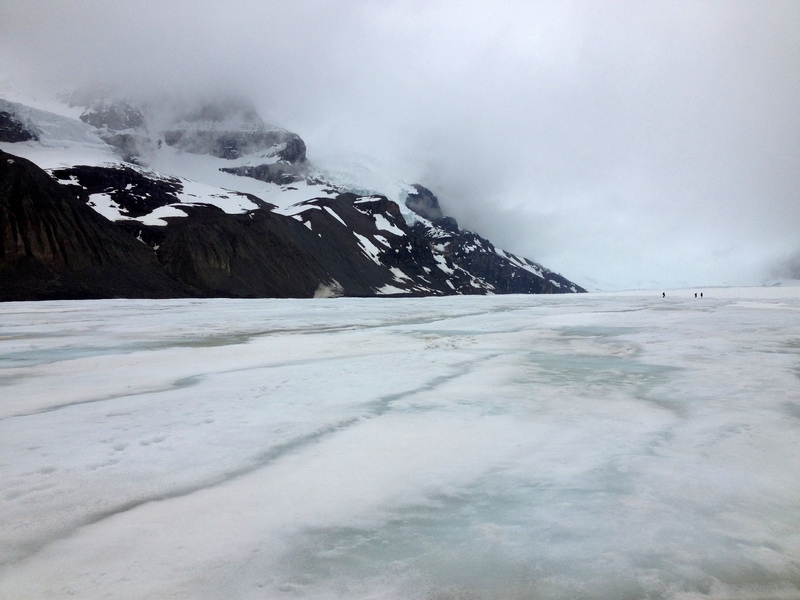 After devouring our lunch sandwiches, we take a short hike on the Columbia Icefield, a massive area covered in glaciers. True it’s not as beautiful as, say, Argentina’s Perito Moreno, but it’s quite impressive. 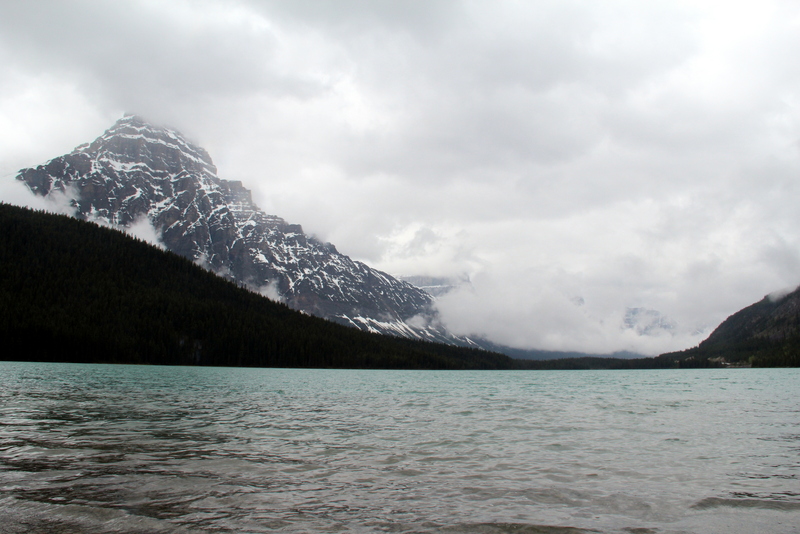 Back in Banff town, we’re exhausted from a packed day, and happy that we made the best out of a disappointing weather. We just have one more wish: eat poutine! On the second day, the weather looks much better, and we head to the most desired hike in the region: the teahouses. 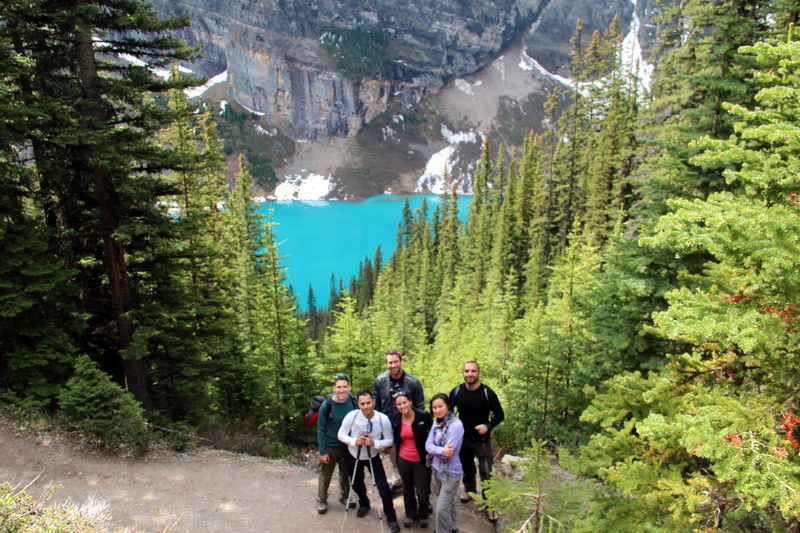 We leave the car at the Lake Louise parking, by the Fairmont Chateau, and start hiking up towards Lake Mirror. The views of Lake Louise on the way are completely surreal: intense turquoise color framed by green pines and snow-covered mountains. Mirror Lake makes honor to its name, offering a perfect reflection of the so-called Beehive. 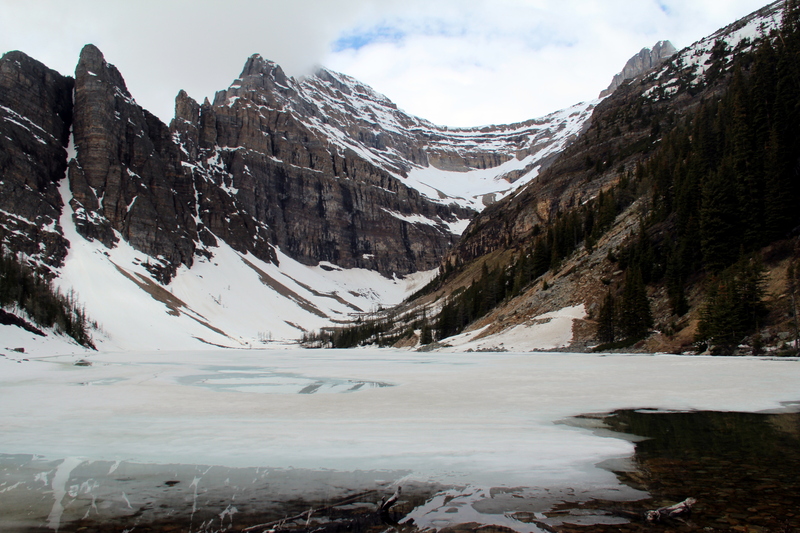 We reach Lake Agnes, which is completely frozen, and take a break at the teahouse. The trail from there is completely covered in snow, we put our microspikes on, and at times even doubt if we took the wrong detour. Eventually, we converge with the main trail that connects Lake Louise with the Plain of Six Glaciers (if you don’t combine it with Lake Agnes). We hike on the hillside, enjoying spectacular views of mountains, glaciers and the ever further lake. We feel like we’re in a an episode of Game of Thrones! By the time we make it to the last teahouse, I’m exhausted and starving, but extremely happy that the sun has accompanied us most of the time. 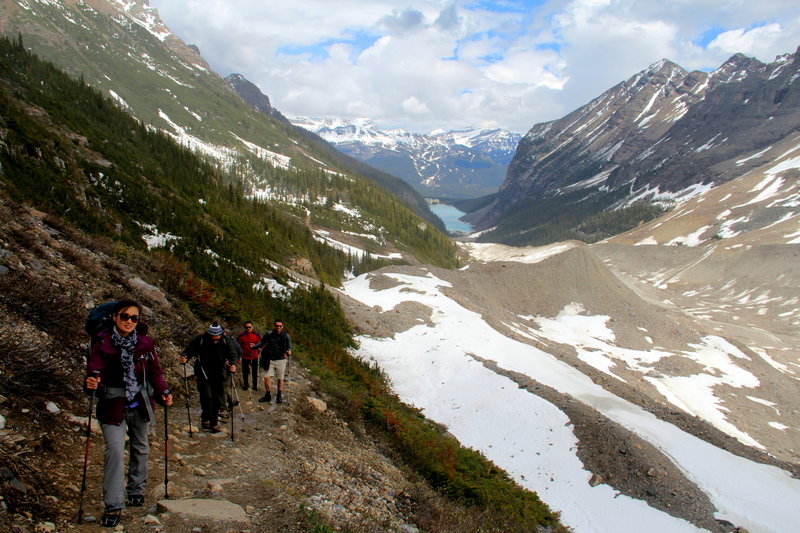 After recharging, we continue up to the Plain of Six Glaciers and then start the way down. The snow is starting to melt, and we witness a small avalanche on a rocky mountain that we’ve nick-named “The Wall”. 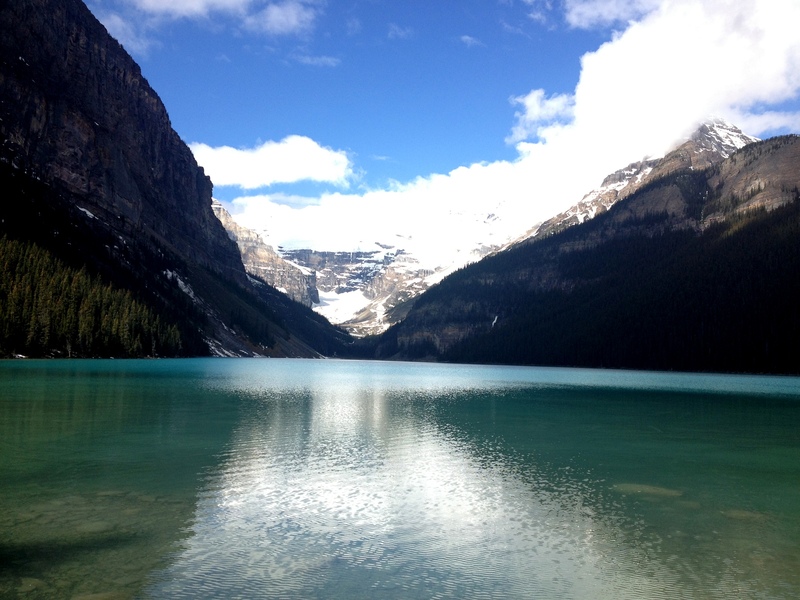 We complete the 12 mile loop back to Lake Louise, which looks more gorgeous than ever. This was definitely one of the best hikes of my life!! On Sunday, we have a few hours before heading to Calgary to fly back home, and want to make the most out of it. 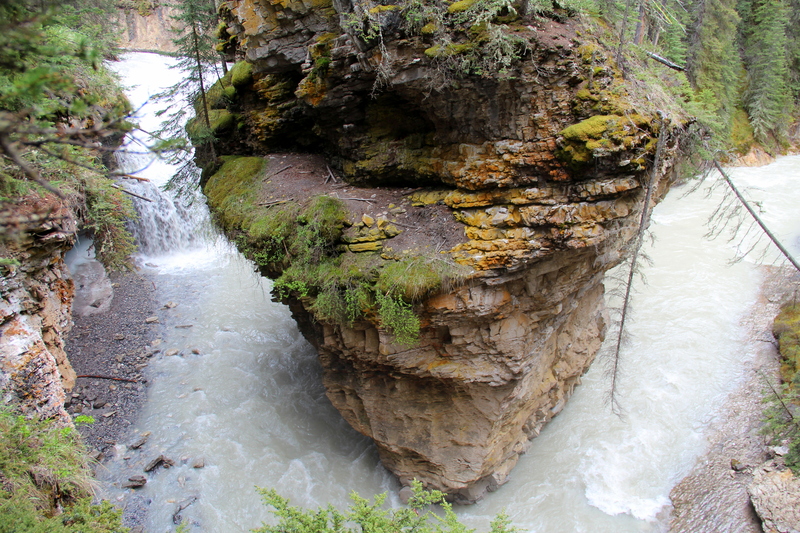 So we go to Johnston Canyon for a short 3-4 hour hike that takes us to some waterfalls and river meanders similar to the ones in Athabasca. 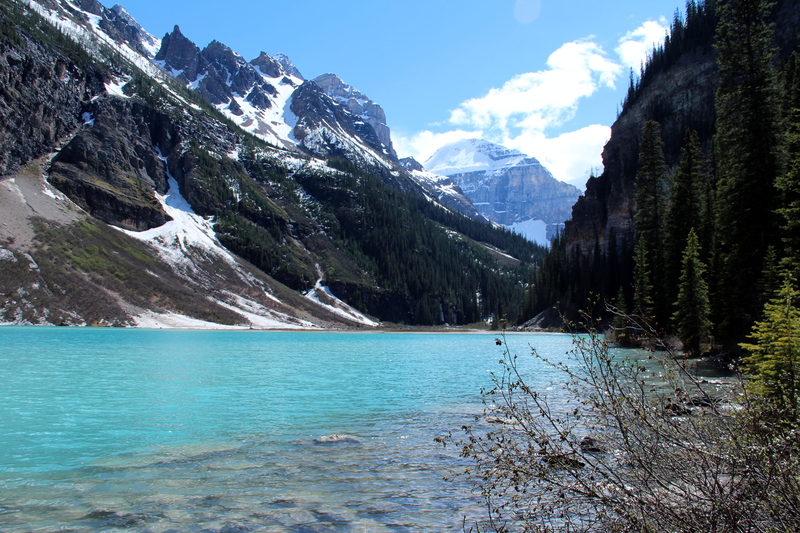 Then we drive to Moraine Lake and walk up to its viewpoint to enjoy the crazy colors one last time; in this case, teal or aquamarine, depending on the light. The clouds cover most of the peaks in front of us, as the weather is bad again. So I promise myself I’ll come back to hike the Valley of the Ten Peaks, Eiffel Lake, Larch Valley… and all the others we couldn’t do this first time that left us wanting more. 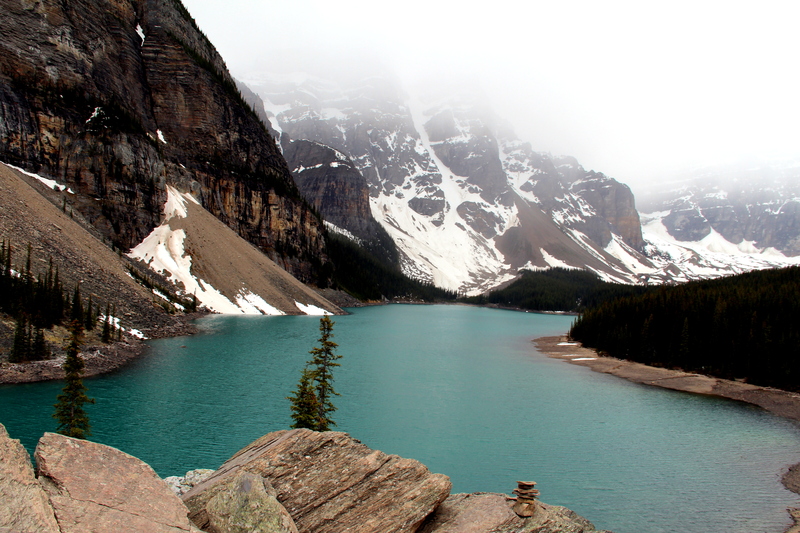 AHHHH I need more Banff in my life. What months did you go?! yeah, Banff is gorgeous! We were there the first week of June and it was maybe a bit too early, with lots of snow and unstable weather… will go back on September, they say that’s the best time. Thank you for taking the time to post! We are heading there during the Fourth of July weekend for 5 days. Great photos. Can’t wait!